If you look at the above map, you will have little idea of which precincts are in the danger zone. Broadly speaking, it comprises the old precincts with some exceptions in Paradise and Sports City. 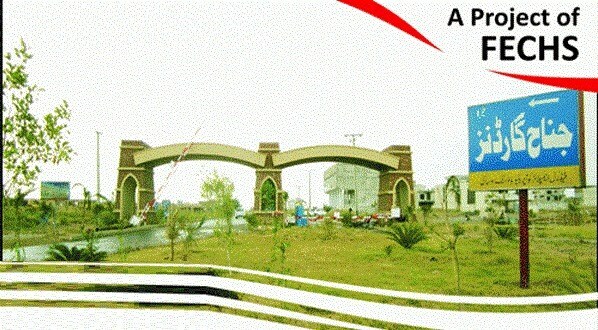 Since Bahria Town had completed most of the development work in the old precincts, it was most important for the society to retain this area at any cost. Remaining new precincts which are in the danger zone including Paradise and Sports City are going to be relocated somewhere else. As Supreme Court has directed the government not to allot any government land – which lies in the surroundings – to Bahria Town in future, we cannot say for sure as to where the affected precincts are going to be relocated. If you look at the area marked in red on the above map, that is part of Sports City Precinct 38, 40 and 41, and it lies in Jamshoro District. As all older precincts have much higher value and Bahria Town doesn’t have ample land left in the old area to adjust affected members, there is high possibility that new precincts are relocated in District Jamshoro. 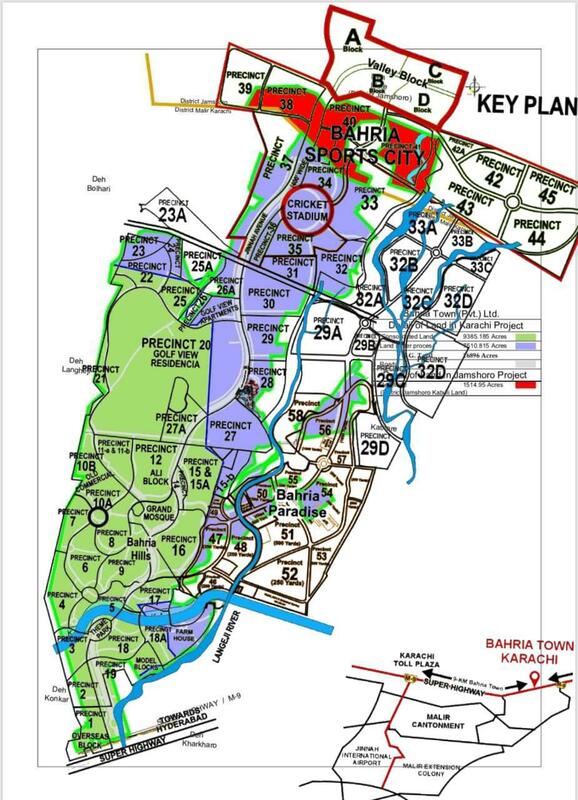 If we place the above map on the precincts map of Bahria Town Karachi, we can have better understanding of safe and disputed precincts. Here you can easily mark the affected precincts which are in danger zone, and unsafe to buy at present – especially the ones in Bahria Paradise which is an expensive commodity. Starting right from the new Towers of Precinct 19, there are patches of unauthorized land in Precinct 28, Precinct 29, Precinct 25a, Precinct 26a, Precinct 33, Precinct 40, Precinct 41, Precinct 47, Precinct 48 and Precinct 54. Remaining precincts have either been acquired or have been disowned by Bahria Town. As plot/home prices in new precincts, i.e. P29 (A,B,C,D), P32 (A,B,C,D) and P33 (A,B,C), P23A as well as Valley Block (A,B,C,D) are very low, this can be a short term gain opportunity for investors. Genuine buyers are not recommended to invest in disowned areas as this will be a very risky investment. The affected precincts falling in Bahria Paradise and Sports City are currently selling at 30% to 40% minus, so it is also a short term opportunity for investors who can take good risk. Once the new locations/adjustment plans are announced, things should start improving. If you have plots falling in disputed/disowned precincts, you should contact Bahria Town for their adjustment/relocation plan before you pay your remaining installments. If you had purchased a plot for your own residence, it will be a better option to sell out your plot in affected precincts and buy something in safe area/old precincts. If you do not want to incur losses, you have no option but to wait for couple of months/years till your plot is relocated and that area is developed. A rumor about Bahria Town Karachi Phase 2 is also circulating in the market which suggests that affected members will be relocated in phase 2. There is no authentic source of this news, but it is very much likely due to unavailability of land in existing area. If you want to invest safely, it is recommended to buy a property in the legalized land only. The future of unauthorized/disputed land will be decided by Bahria Town in coming days/months, and it can take much time for Bahria Town to adjust thousands of affectees. Unless you have many years to wait, it is better to stay out of risky investments. Should you require any further information on the cleared/disputed land of Bahria Town Karachi, or you want to buy/sell a property, feel free to contact us via email at marketing@manahilestate.com or whatsapp at 0345-5222253 for quick assistance.